Mystery! Every day we live with this word. Why some things happen? Or who is behind all of this? This whole world is full of mystery. Starting from ‘The Bermuda Triangle’, then ‘The Great Pyramids of Giza’ or stories of UFOs’ flying in the sky! Most of these stories are either true i.e. having valid historical proof but some stories are the imagination of human brain or who knows, maybe someone is watching us from outside the Earth. 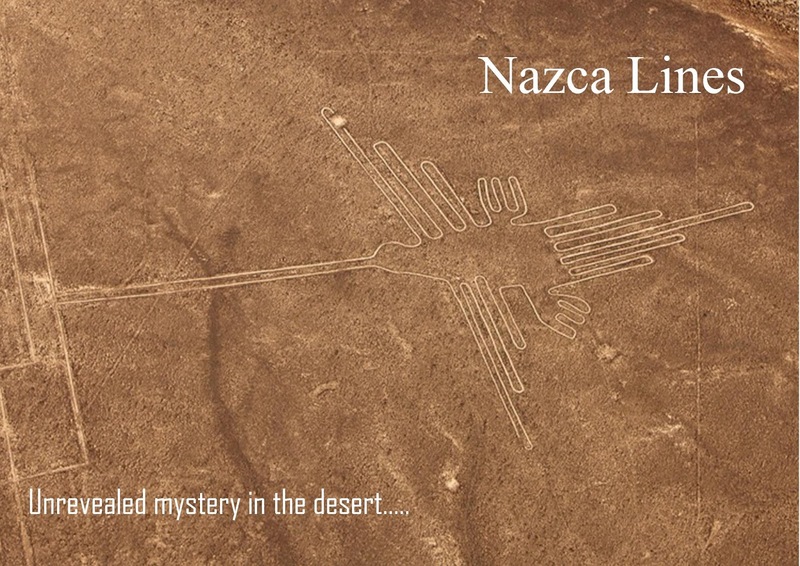 Few days back when I was watching an episode of ‘Ancient Aliens’ on YouTube, I saw something on The mysterious ‘Nazca Lines’ and I found that topic interesting and decided to collect some information on this mysterious place. So, this article is going to be a short summary of that collected information! Okay, first let me clear myself that, I am not inventing anything or not having any deep research on Nazca lines so you will also find this information on internet, but in a scattered manner! 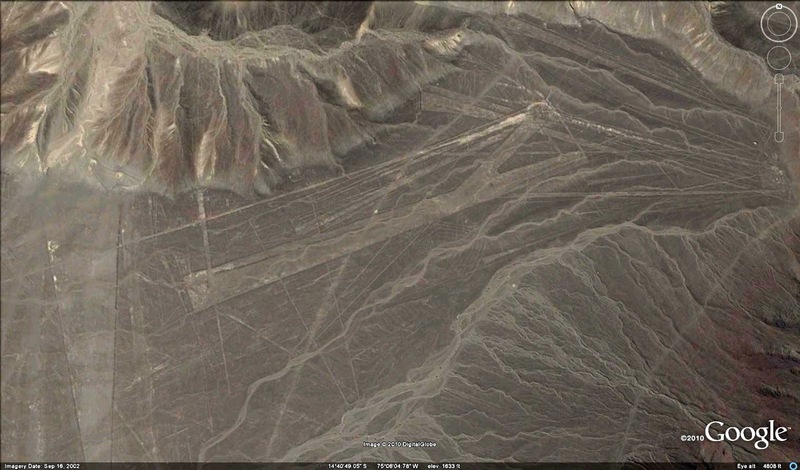 Nazca lines are the series of ancient geographical (!?) structure located in the southern part of Peru i.e. 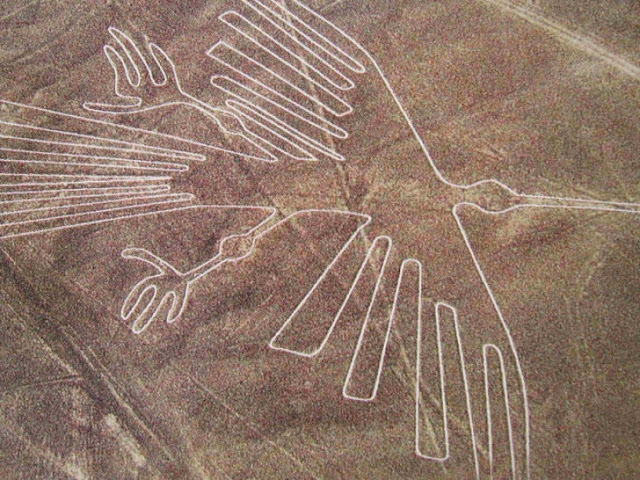 in Nazca desert. These lines were declared as a World Heritage Site back in 1994. 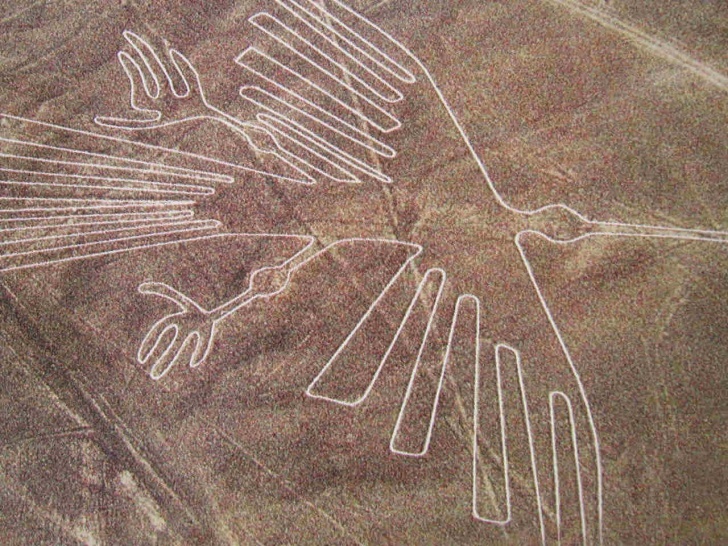 Many archeological scholars believe that these lines belong to the ancient Nazca culture way back in between 500 B.C. and 500 A.D. You will find more than 100 geographical figures drawn with simple lines including some figures of animals or birds such as spiders, monkeys, fish, Humming Bird and huge plane strips like an airbase. Now, what’s mysterious in this is that these lines can be visible on from atop surrounding either from foothills or from air. “The figures are of a whitish color on a brown surface, this brown surface is a thin covering of dark stone about 10 cm, which suffers the process of oxidation giving the entire region its particular brownish effect. Underneath the soil is still whitish, not brown, comprised of a mixture of rock that had been split into small fragments due to extreme temperatures, and clay, which ultimately was blown away by strong winds coming down from the Andes. There are extremely strong winds here, even sandstorms, but the sand never deposits over the drawings. On the contrary, the wind has a cleansing effect taking away all the loose material. This way the drawings were preserved for thousands of years. It is also one of the driest places on earth, drier then the Sahara. It rains only half an hour every two years! The figures, the drawings, are very superficial furrows never more than 30 cm in depth, and very shallow. For this reason the wind has obscured them by filling them with small dark pebbles from the surrounding surface like grain, making them difficult to detect from the air”. Even though considering all these points, the question still remains that How they were created? Because, some of these lines are having a length more than a kilometer having specific angle between connecting lines. For whom these lines were created? And what’s the purpose? How were these lines made? As these lines can be seen only through air, one many think that it would have required an observer who can fly and guide the creators. However as per Dr. Persis B. Clarkson, “It was just a matter of will and nothing great technology”. To prove their words, a group of 10 volunteers helped, Anthony Aveni an astronomer and anthropologist, in a study of the Nazca lines. And within a half an hour, without any pre-decided plan they constructed a straight line having a length of 35 mtrs and widening 1 meter long. So, it was fairly concluded that it was not necessary for Nazca people to have great mathematical or engineering skills. It was just a matter of working in groups with their eyes and hands. Why these lines were created? Well, it is hard to say, as there are dozens of theories and yet we have not found any conclusive evidence that can firmly support anyone’s theory. 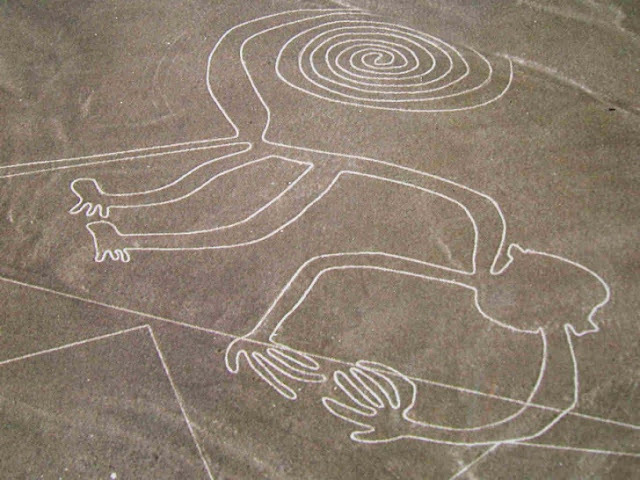 But a general theory believes that, Nazca people were very religious people and they created these lines which can be only visible through sky just to insure the good will of the Gods. But still this theory has not any proof! Paul Kosok who was the first person who proposed tan astronomical meaning to these lines when he observed in winter season that the Sun setting exactly over the head the end of long lines. By keeping track of positions of moon and sun through these lines, Nazca people would have predicted when to plant and when to harvest. 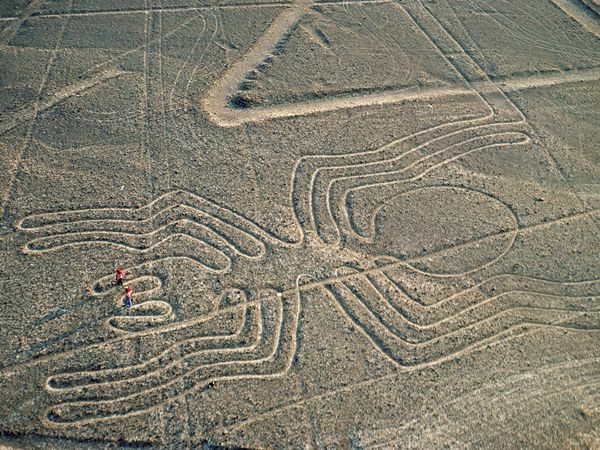 But it is difficult to say what Nazca people have thought while drawing the monkey or spider from astronomical point of view. 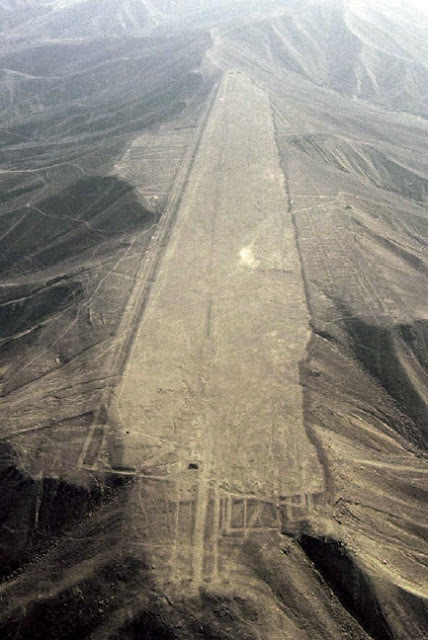 The connection of Nazca lines to extra territorial objects were established after the theory proposed by Erich Von Daniken in his book ‘The chariots of Gods’. He proposed that, aliens landed in this area and created these lines. Anyway, it is not necessary for us to contradict their views without having conclusive evidence. Even if we allow the possibility the existence of aliens, the dessert land is too soft to land any aerial vehicle and still does not explain why these animals like structure were created. All these theories are a pure imagination of human brain. But still every theory is a worth to notice as in some ways their imagination is as good as any. It is not known to us that how these lines were created and what’s the purpose behind creating these lines was. The most logical explanation which I found is the theory proposed by Johan Reinhard, known for his research on Incan ice mummies. For animal figures John proposed that, they might be the manifestations of the mountain gods, who were believed at that time to take the form of different animals. Because in today’s world, ‘Andean’ people still worship the mountain as their gods. And we refer these figures, which are clearly visible from the top of any mountain. For straight lines he proposed that these lines were made by walking, like as a footpath. Whether created by extra territorial objects, or whether created as a homage to gods or sacred pathway or simple to predict weather, these lines, figures inspire us continuously to inquire about the past, to search that what was happened in past and which also remind us that there are some forces on earth which can be never understood. Truly said by someone, “life would have been a less interesting if there were no mysteries to u reveal”. The soil being soft - is the ground for ruling out the theory of Airstrip. However this presumes the vehicles to be heavy with a landing method of the currently known technology. You might be interested to look at it - alongwith the trident etched on the cliff of the coast of Paracas (Peru) and the small models of airplanes found in South America. The trident appears to point towards the Nazca Plateau, and is apparently designed to be visible to people coming from the Pacific. Any waterbourne vessel coming from pacific surely could not climb the Andes to continue their journy to Nazca. 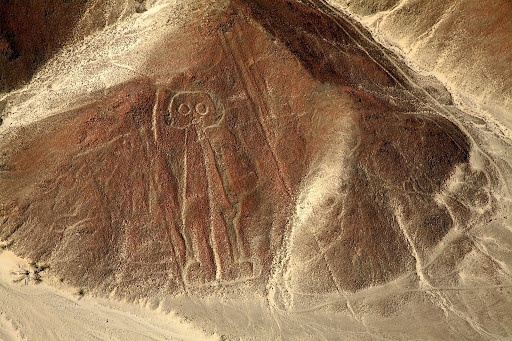 Moreover, if you presume an aerial route from Australia to Nazca, you have something on the way that could be visible to a flier - the statues on the Ester Islands. Rathar than Daniken, a hypothesis discussed by Richard Mooney in his book "Colony Earth" (Corgi Publications, though currently out of print) would take us to a more plausible path. He discusses a scenario of an advanced civilisation on Earth, getting an early warning of destruction - what would it do to (try to) perpetuate the humankind with as much knowledge as possible. An indicative example would be as in the movie "2012".